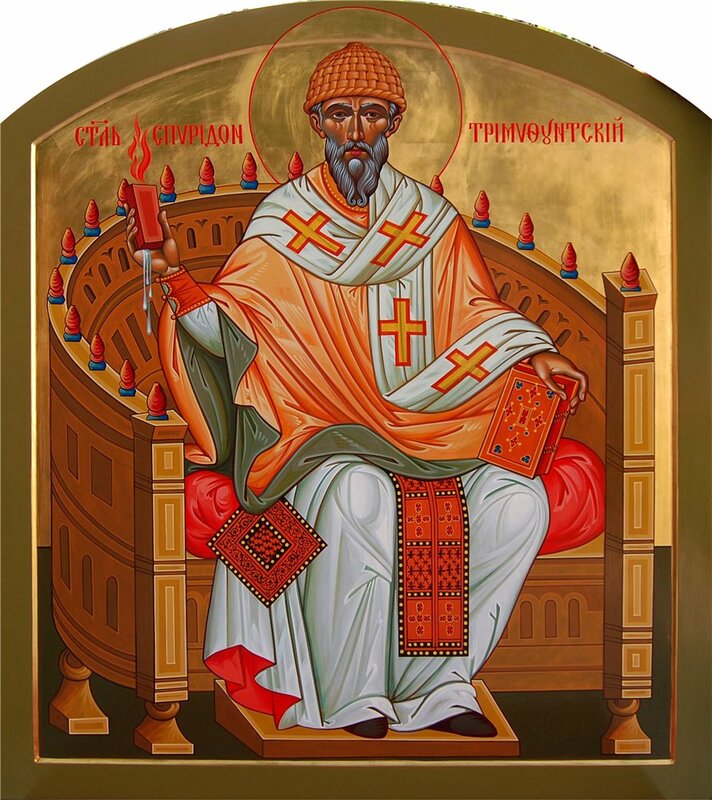 Tomorrow (December 12th) if the feast of St. Spyridon, Bishop of Trimythous, the Wonderworker. 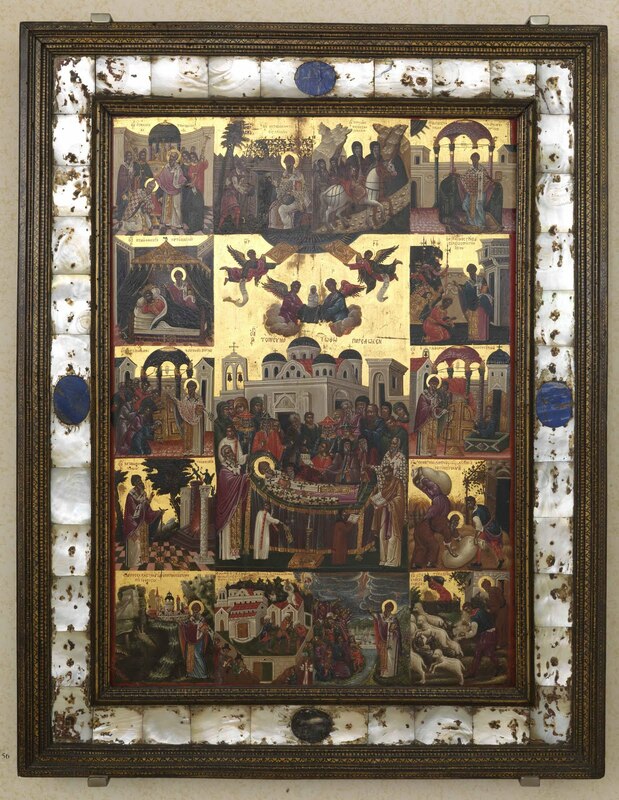 He is one of the most beloved Saints of the Orthodox Church, the Protector of Kerkyra (Corfu), Cyprus, Piraeus, potters, and many who bear his name. His life is filled with love, humility, and the Grace of Christ, and is worth reading. The OCA website has an excellent and thorough account of his life: http://ocafs.oca.org/FeastSaintsViewer.asp?SID=4&ID=1&FSID=103526. 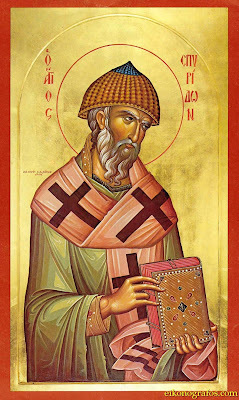 For another very thorough account of his life that I just came across, see: http://www.saint-spyridon.com/archive_spyridon.htm. She insisted, however. And then the Saint with austerity revealed the face of the sin of all. The woman was in awe, and with a broken heart and tears she began to seek the mercy of God. Before this repentance, the loving father said with emotion those words once said by the Lord to such a sinner: «Take heart, o daughter. Your sins are forgiven you.» Go forth and be careful in the future. 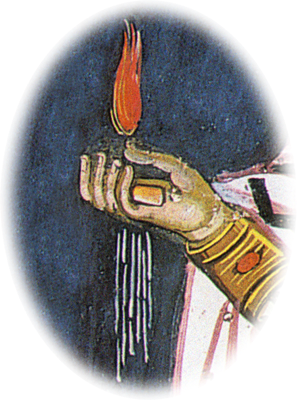 With his way, the Saint helped the woman who was a sinner to repent. He also gave a lesson to all. Only sincere repentance cleanses and restores the soul of man its honored position, to be a child of God." What good, he was thinking mentally, to have for my bishopric some of the buildings located in this place. They would give me a good income to face so many needs. -What are you thinking, my brother? 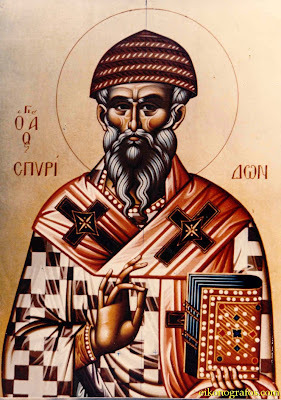 St. Spyridon said. Why let your mind be occupied with such vain things at this time? -My Geronta [Elder], were you reading my thoughts? -My Father, forgive me. I was defeated by visions. Prayer to our Lord to forgive me. How much wisdom is in the words of the Divinely-illumined Bishop. Instead of man thinking to hymn and glorify his Maker and Fashioner before the majesty of the Almighty Creator, as one generally does, one yearns to acquire and enjoy the goods of the earth." 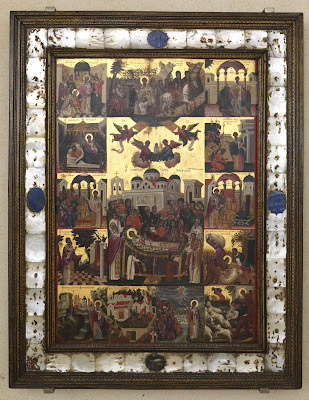 Two other miracles I think are worth mentioning from his life, also because they are mentioned in his apolytikion below. "One day, another poor family knocked at the door of the Bishop. They approached the Saint with tears and asked for a loan. He wanted to pay a debt to a rich man who threatened to sell their home. But where would the Saint find that much to give? The pain that gave rise to bitter tears of the poor family, torn by grief, struck the loving bishop, and he went for a walk. Suddenly there was in front of them a snake slithering through the green. Like lightning, the rod of Aaron struck the mind of the Saint, which at the palace of Pharaoh fell to earth and became a snake. «As it is, Lord, may this snake become gold for this poor family, he said slowly. Yes, Lord. Let it become gold to help this miserable creature of Yours», and again lifted his hand. The snake stopped, and the Saint bent down and picked it up. In his hands the disgusting serpent was transformed and now show forth as gold. -Take it, son, said the Saint with kindness. Take it and do your work. And the poor man full of joy took the gold and ran to give it to the rich creditor. When the man, with the help of God, paid the debt, the lender returned the golden pledge. The poor man took it back with tears of gratitude and returned it to the Saint. Once he received it in his hands, he turned his eyes towards to heaven, glorified God for His infinite charity, and then threw it to the earth. And miracle of miracles! The gold became a snake again and and left ahead of them." -My Father, I have it hidden in that certain place. Then the Saint said: -Sleep, my daughter, in peace. Sleep until the day when the Lord will raise us all in the General Resurrection. Those who were there were shaken and were left speechless. They reflected on the strength with which the All-good God endowed this simple but holy bishop. The good shepherd, who would do everything for the benefit and service of Christians." 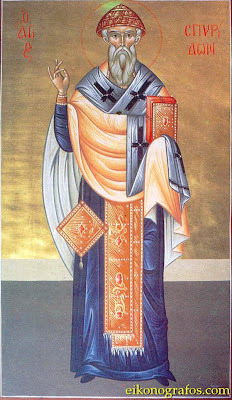 Apolytikion of St. Spyridon - Mode 1. The stone had been secured. At the first of the Synods, you emerged as the champion, * and wonder-worker, our God-bearing Father Spyridon. * Wherefore, you addressed the dead one in the grave, * and a serpent you changed to gold. * And while chanting* in service your sacred prayers,* you had angels concelebrating, O most Holy One. * Glory to Christ who glorified you,* glory to Him who crowned you,* glory to the One who works through you,* healings for everyone. 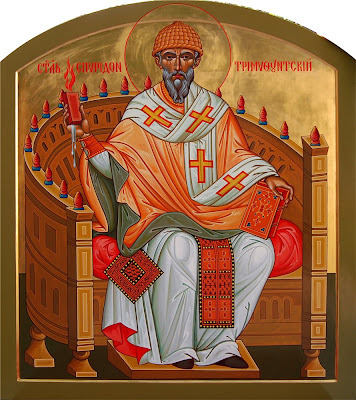 St. Spyridon, intercede for us!